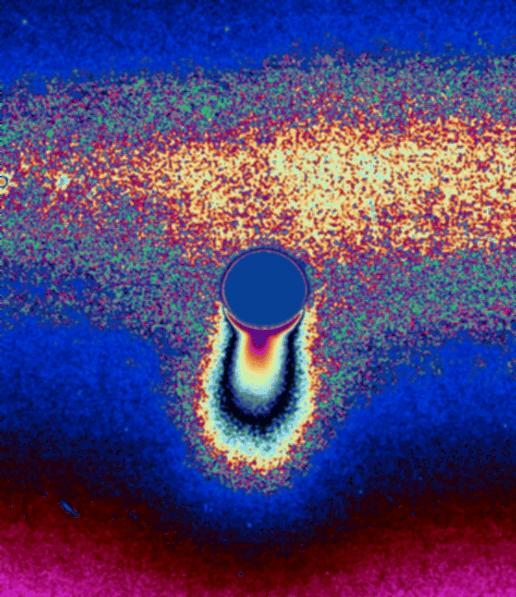 Where in the solar system would one NOT expect to find a hot geyser? Well – certainly not 900 million miles – 10 astronomical units – from earth! The temperatures on these bodies hovers way, way, way below the freeing point of water – at hundreds of degrees below the freezing point of water! And yet - there they were - caught in the act on Saturn’s moon Encladus! Cassini caught them spewing water ices into space on three fly-bys. This is so important, that Encladus has immediately become the focus of interest for future exploration. It appears there may be oceans of liquid water just below her surface. This photo shows the ice jets of Enceladus send particles streaming into space hundreds of kilometers above the south pole of this spectacularly active moon. Some of the particles escape to form the diffuse E ring around Saturn. This color-coded image was processed to enhance faint signals, making the contours and extent of the fainter, larger-scale component of the plume easier to see. The bright strip behind and above Enceladus (505 kilometers, 314 miles across) is the E ring, in which this intriguing body resides. The small round object at far left is a background star. To watch an interesting NASA video, click on the link below. When you get there, look for the Enceladus video on her ice jets. Click here - Cold Faithful.